Summer is a comin’! I am at that time of the year where I am ready for summer. I am ready to sleep in, spend the days with my girls and enjoy some light summer recipes by a pool somewhere. I recently went out with some girl friends and had the perfect salad that I have been obsessing over since. What was so amazing about this salad? 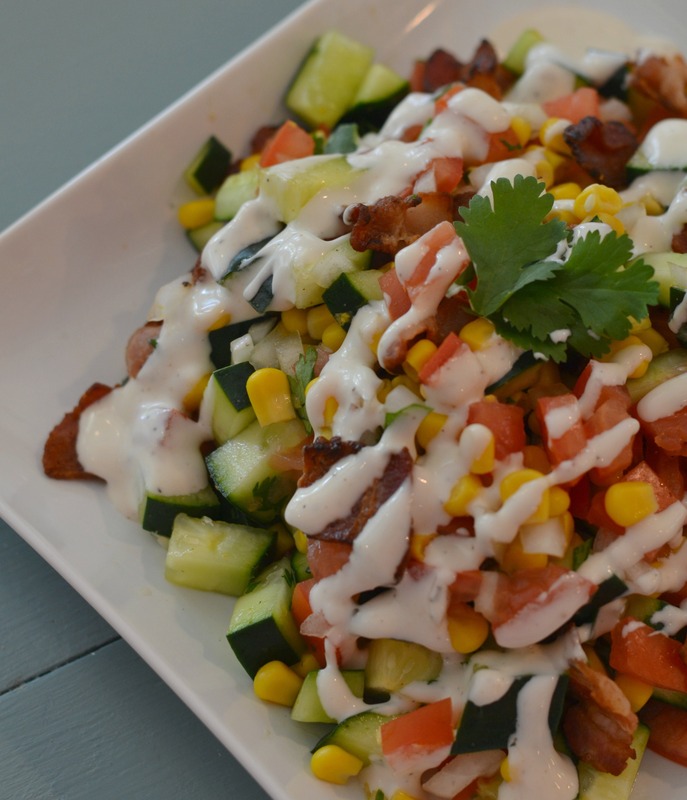 It’s a cobb salad with just the good stuff. You know the good stuff, the toppings that you pick around for that make that perfect bite. Considering that I do not want to go broke from having to eat out everyday I decided to make my own version. This salad is now a weekly must have and perfect for summer. 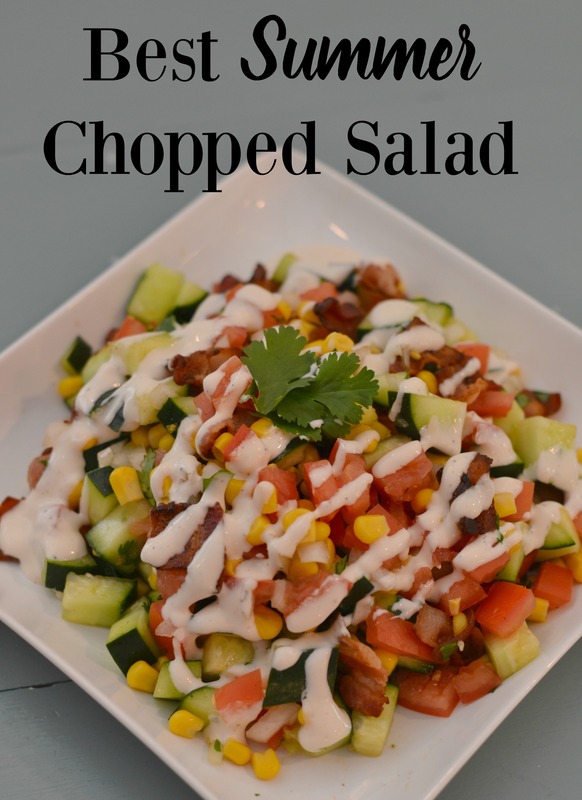 It is seriously the best summer chopped salad I have ever eaten. It’s so delicious… I may or may not be eating right now! This salad is super fresh and so easy to make. I can’t wait to go to our favorite farmer’s markets this summer. Fresh tomatoes, delicious! In a large pot over medium/high heat cook your chopped bacon until crispy. Set aside and let cool. Chop and mix cucumbers, tomatoes, onion and cilantro a large mixing bowl. Rinse and drain the corn and add as well. Once your bacon is cool add it to the vegetable mixture along with the avocado. *Note: If you make this salad ahead of time, do not mix in the avocado until it’s time to serve. Drizzle with Your favorite dressing (ours is ranch) and enjoy! 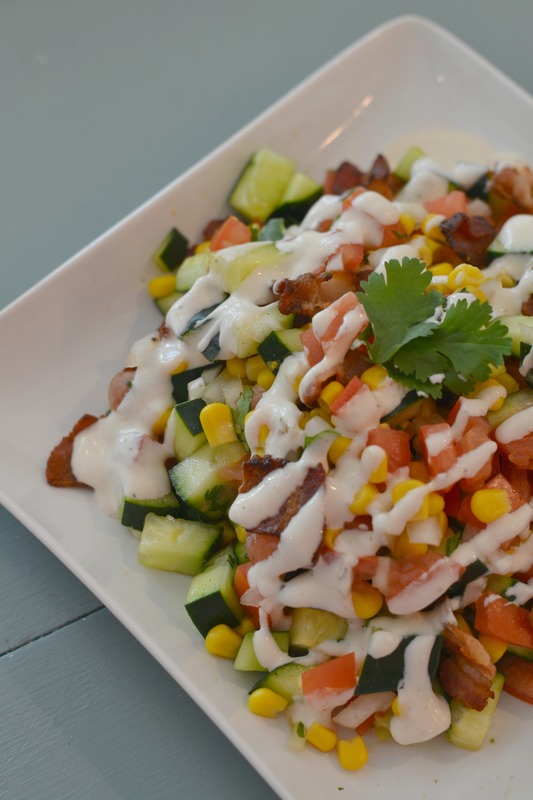 There you have it, the best summer chopped salad ever! You guys, this salad. It’s just so addicting. What are some of your favorite go to recipes for summer?